The first of the ISBInsight Short Guide series based on insights from our archives. The Government of India came up with the ‘Smart City Mission’ in 2014. The aim? Developing 100 Smart Cities in India. What kind of smart cities should India aspire to develop? This Short Guide highlights insights on smart cities in India drawn from our archives. ISBInsight was one of the first publications to devote an entire issue to the theme in December 2015. Drawing from the experiences of the developed world, this series of articles not only provided fresh insights into this largely unexplored territory but also served as a guide to smarter cities. Indian cities should aim to establish a collaborative, inclusive, dynamic, result-oriented and fiscally affordable city development process. The process of planning should reflect the vision of multiple stakeholders like citizens, public bodies, private enterprises. The plans should be flexible and responsive to city specific real estate markets and socio-economic contexts. They should be geared towards effective land management and technological innovation in the delivery of services. A smart city is commonly defined as one which leverages technology to integrate and optimise its limited resources towards better habitability, sustainability, efficient delivery of services and citizen empowerment. Hence Information and Communication Technology lies at the foundation of smart cities. What role does ICT play in smart cities? Prashun K Dutta in his article ‘Self-Organising Smart Cities’(27th April 2017) argues that ICT can facilitate integrated management of the city, efficient delivery of public services, improved communication networks, city assistance tools, information security, address city specific needs and help in the city’s integration with its hinterland. A city bolstered by a properly designed ICT and a corresponding distributed work organisation can aspire to being self-organised in the management of its services. What are the various components of the capacity building process necessary to ensure inclusive and sustainable urban development? In the article ‘Capacity Building for Smart Cities’ (1st December 2015), O P Agrawal argues that massive education and training, context-specific research endeavours, knowledge exchange through seminars and workshops and building a strong national database as a repository of knowledge are key steps in the process. Are Indian cities ready to leverage and use smart technology to their advantage? Deepa Mani and Sankhadeep Banerjee at the Srini Raju Centre for Information Technology and the Networked Economy developed the ‘Smart City Maturity Model’ (article published on 28th April 2015) to help cities assess where they currently are in their journey towards smart development. Where do the smart Indian cities stand in terms of their performance? The newly developed Smart Cities Index by the Punj Llyod Institute of Infrastructure Management at the Indian School of Business (ISB) provides a comprehensive framework for assessing the quality of city services for the 53 million plus cities in India across a variety of characteristics like living, economy, people, governance, mobility and environment. 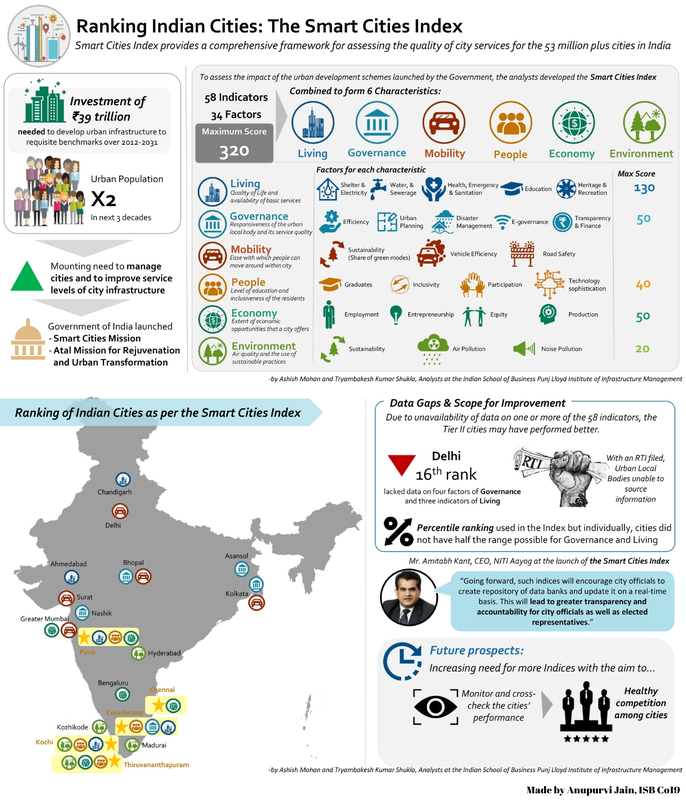 The following infographic developed by Anupurvi Jain, PGP student at ISB as part of the ISBInsight Student Challenge, summarizes the the article ‘Ranking Indian Cities: The Smart Cities Index’ (Mohan and Shukla 2018). Debdatta Chakraborty is an editorial intern with the Centre for Learning and Management Practice. Anupurvi Jain is a student of the Co19 batch and will be joining ZS Associates as a consultant this summer.